What methods are you using to hide from deer? It's time to up your game. When we say "hide from deer," we're talking specifically about blinds and stands. Planning on where and what to set up in is a major decision, one that should be made well before the season ever starts. These five things are indeed great ways to hide from deer, and tilt some success in your favor. Deer generally don't look up for predators. Get up high and out of view with a ladder stand that is built strong. Remember, 25 feet is a long way to fall. Make sure you wear a safety harness also. 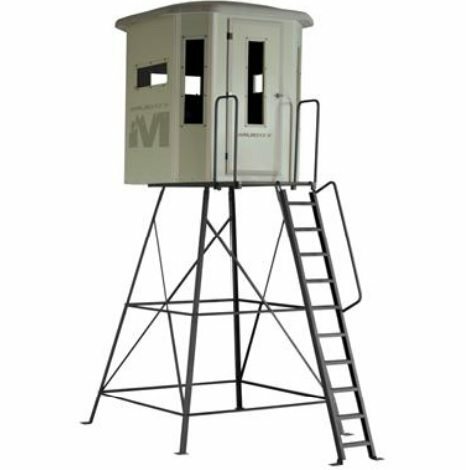 When a high treestand is not an option in your hunting spot and you need complete concealment, the tower blind is the way to go. With this option you will stay out of foul weather's way, out of a deer's line of sight, and in prime position. In backcountry and public hunting areas, packing in your stand on your back is the only real option. It's also a surefire way to keep thieves from stealing your hard-earned hunting gear. A climbing treestand is a no-brainer in this case. When the cold winds are blowing and rain, sleet, or snow falls, a cozy ground blind is hard to beat. Get a quality brand that will last many seasons. A quick deploying ground blind puts you in the action zone, concealed within minutes. The ultimate in hunting comfort and game spotting is certainly a hard-shelled tower blind. From a height of over 16' the above tower blind is what most deer hunters dream of. Who needs trees for stands? This is the apex deer hunting stand, hands down.